Mirzo Ulughbeck was one of the outstanding statesmen, scientist and enlightener in the history of Uzbekistan. He left rich heritage for the science of the East. One of his service was the building of educational institutions – madrassah. The first mardasah, built by his order, is located in Bukhara and is the only evidence of activity of this scientist in the city. The building was erected within quite short terms by the best masters of their times Najmetdin Bukhari and Ismail Isfagani, in 1417. From architectural point of view, it is the square building with traditional courtyard and high portal on the facade. 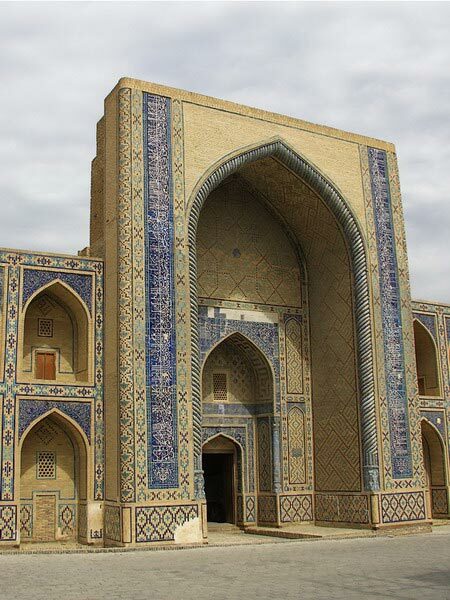 Interesting way was applied to the entrance: the corridor leads not directly to the courtyard, but is made parallel to facade, and leads from gate to two sides – to the classroom (darshona) and to the mosque. The facade of madrassah consists of portal, two side towers and double decker wings with deep niches. The portal an walls are covered by ornaments and decorations of various epochs but united by astronomical direction. From time to time the madrassah was submitted to the restoration and therefore elements of decoration are differed by the way of production and covering. In addition, doors of the marasah have the carving of the motto of Mirzo Ulughbeck: “Will to study is the obligation of every Muslim man and Muslim woman”. Also you can find here another saying: “Let the doors of God’s blessing will be every day opened over the circle of people, versed in book learning”. Today it is one of the most beautiful architectural sights of Bukhara, which is distinguished by the austerity of forms and harmony of colors. Not without reason this madrassah serve as the model for construction of other educational institutions in many cities of Central Asia.